The question begs: why wouldn’t you? There may be times, as a young adult, that you could not imagine traveling with your parents because you wanted your independence. You wanted to go to a bar and maybe meet friends, watch the sun come up and ‘experience’ the world. As a mature adult, you realize that your tastes have matured and you have to slow down. You don’t have to travel in the lap of luxury but you also know that sleeping in a hostel is just not a thing. When I decided to take a road trip with my 85-year-old mother, I knew that the pace would be very different, the meal schedule would be more consistent and the bedtimes slightly earlier. What I did not account for was the realization that this trip would provide precious memories as they become less frequent in the future. My mother has slowed down significantly in the last year and she does not keep the blistering pace that she once kept while traveling so accommodations will have to be made. 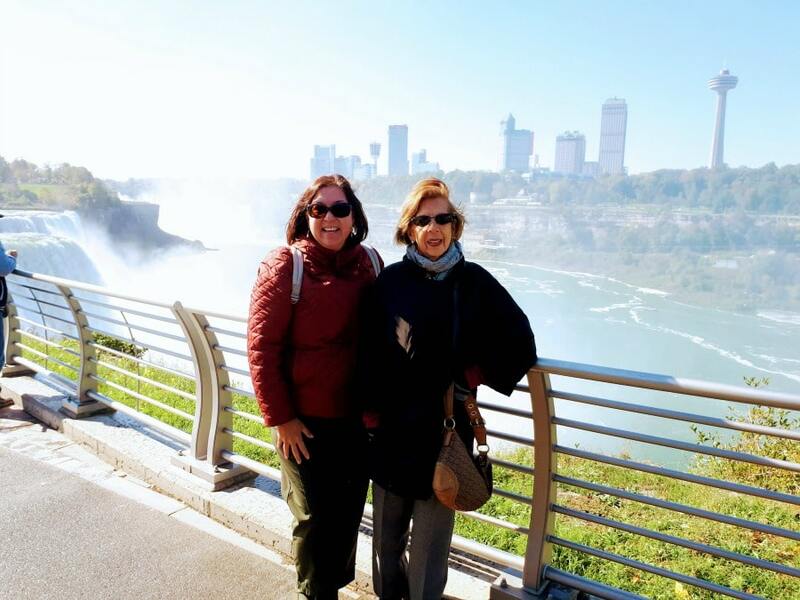 Our ‘slow travel’ adventure began as we crossed the Rainbow Bridge in Niagara Falls and made our first stop in Niagara Falls State Park. I don’t recall ever seeing the Falls from the American side so it was well worth the stop. We took the long and winding road to the interstate to make our way towards Rochester where we would be spending the night then pushing on to Glens Falls, Lake Placid and our final destination of Montreal. Although we were making our way across the state, I wanted to make it enjoyable for my mom. I needed to remember, when you are traveling with a senior, you have to take bathroom and stretching breaks into consideration. Accept that you’ll need to take your time to plan your itinerary accordingly. We visited three different museums. We thought we could do two in a day but that was not realistic. As any road trip, prepare your car for the long haul. Get an oil change, check tire pressure, clean the car and stock up on essentials (Kleenex, water bottles, snacks, extra blankets, gloves, hats, sunscreen). 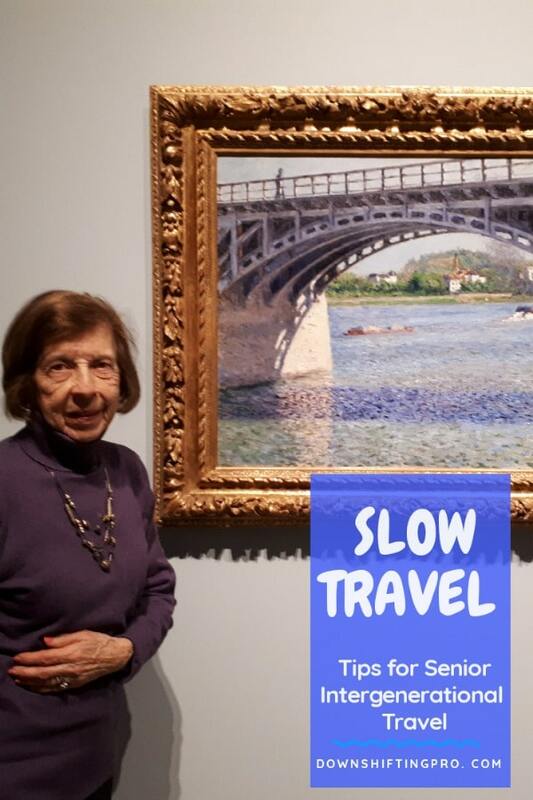 Like children, intergenerational travel with seniors requires you to provide entertainment. Having a DVD or an audiobook is a GREAT IDEA. Some seniors do not like to look at things on a tablet so an overhead DVD with a good movie is very distracting. We love audio books and find that time flies as we listen and take in the scenery. Having magazines or asking them to bring a good book (large print of course) will also help with the tedium of long drives. My mom also enjoys word searches and coloring books. Check out some of our favorite travel gear to make any trip a little easier. Stop for the small stuff. Take the time to see those attractions that you would normally drive by. World famous cheese producer? Birthplace of Mark Twain? Museum of miniatures? Let’s go! Sometimes those unplanned stops are the most memorable. Buy travel insurance. No matter how short the trip, you never know when a senior will be unwell. If there is an emergency, you’re covered. Senior travel is all about preparing for the unexpected. Consider getting a temporary handicap pass if mobility is a concern. Discuss with their doctor if they believe it would be beneficial. You may find yourself at an attraction where parking close to the entrance would be helpful. Also consider the weather, walking on snowy or icy sidewalks or parking lots could be dangerous. While you are at the doctor’s office get a list of all medications and ask the pharmacy to place them in a blister pack with the names written clearly on the package. Blister packs help you and them keep track very easily. They were a game-changer for my mom! Bring the kids. There is no better way to create memories for your children than bring them along for the ride. They will help grandma read those ridiculously small print signs besides that painting that she likes and they can wait with her in the lobby while you park the car. One of the most memorable moment was when we visited the Henry Ford Museum and my mother-in-law told my son her first boyfriend had a car just like that. Spoil them a little. Grandparents tend to be good at spoiling your children, it’s time to spoil them right back. Don’t coop them up in a hotel room with 5 of you in there. Splurge and get them a room of their own and maybe one or two of the children. Don’t burden them with the little ones, give the child that will help out! Have fun! Make sure to have enough – and a variety – of activities. Overscheduling is not the answer – choice is. 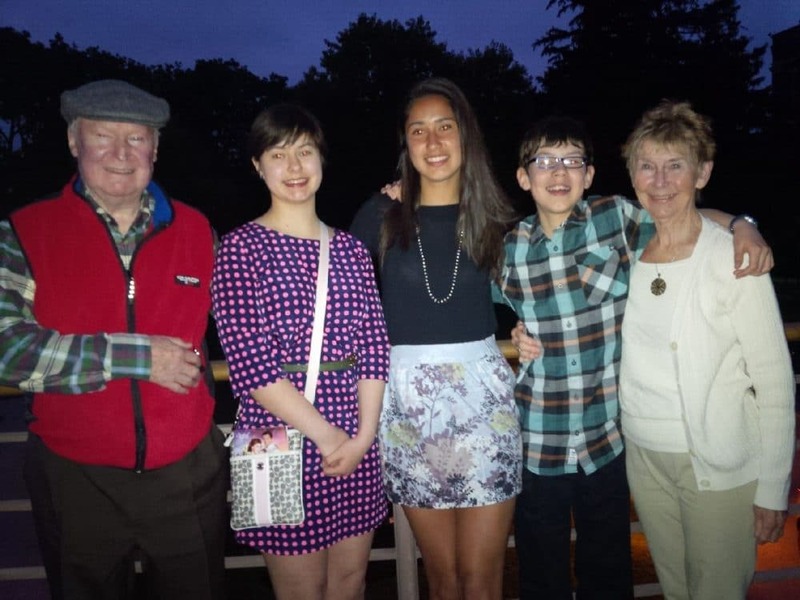 Intergenerational travel is about giving the children and the grandparents the choice to do things together and/or separately throughout the day. You can have meals together but split up in the morning and then get together again in the afternoon. One parent goes off with the kids to burn some energy while mom hangs back and meanders through the museum with the grandmas! Take plenty of pictures. Show your mom how to take the perfect selfie and then send it off to your siblings so they see how much fun she is having. Create a travel journal and post your trip updates on Facebook so that everyone is aware of what we are doing. It gives them peace of mind when we are out of the country! Planning a successful trip with a senior can be just as fun as traveling as a couple or as a family. When your senior chimes in and adds their narrative or point of view (‘it was/wasn’t like this when I was a child’ or ‘this reminds me of when I was a young bride’). Intergenerational travel also means you will learn things about yourself: patience, a sense of humor and where all the bathrooms are between here and Rochester! 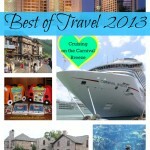 Margarita Ibbott is a seasoned multi-generational travel blogger. Her love of family travel began when she was very young. She still remembers the epic road trip her parents took with her immediate family, her grandmother, and uncle in the 1970s. 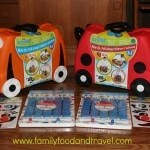 You can find out more about her travels with her family, her mom, and her blogger friends at DownshiftingPRO.com. Follow her on Instagram and Facebook too! What a great post! I love watching you and Lita travel together. 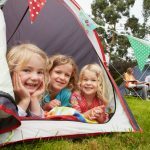 This is a very clear guide to what things you can look forward to and what small accommodations need to happen to make this a memorable adventure for all. I hope to see many more posts about your travels. I also love the comment about posting daily to Facebook so that relatives and friends know you’re having fun and you’re safe and travel insurance of course no brainer every time so important especially when travelling with seniors. When you’re as a gift we sent my grandma to Florida to visit someone she knew there and to stay for a week and while she was on the plane I believe she had a leg problem which was thrombosis and she ended up in the hospital in Florida for three or four weeks. It would’ve been financially crippling if they had not purchased travel insurance for her. I hope your kids realize what a gift it is that their grandparents can travel with them still. I very much wish we’d had more time to travel with my mom. I love traveling with my older relatives. It’s so much fun to experience everything with them, and I actually prefer the slower pace. There is just so much I love about your post. 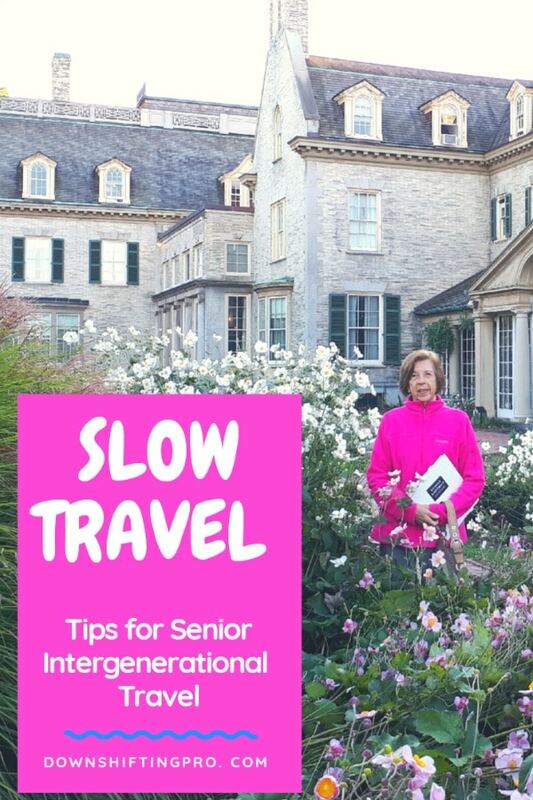 First so many great tips about traveling with a senior. Second the memories you made doing a trip with your Mother is just more than awesome. Thank you for including fun pics. Also your Mother looks terrific! Thank you for your kind words about my mother. She will love it. I have learned to change my travel style and for now, I’m o.k. with that. These are great tips. I wish I was able to travel with my mom before she passed. I love this concept of slow travel . And travelling with my mother is a dream. I should do it! My grandma likes to travel but mobility is such an issue. I am sure she would travel more if she could get a pass. I loved reading this post! It gives my quite a different angle of what I need to think about and prioritize when traveling with my older parents. Awesome post! These are great tips! I enjoy traveling with my parents and I prefer slow travels like them. Great tips. My mom loves all her grandchildren dearly and I am sure she’d not leave for a trip without taking her grandchildren with her. I will bookmark this page for reference.